I had so much fun this weekend coming back to my studio! To my paints! 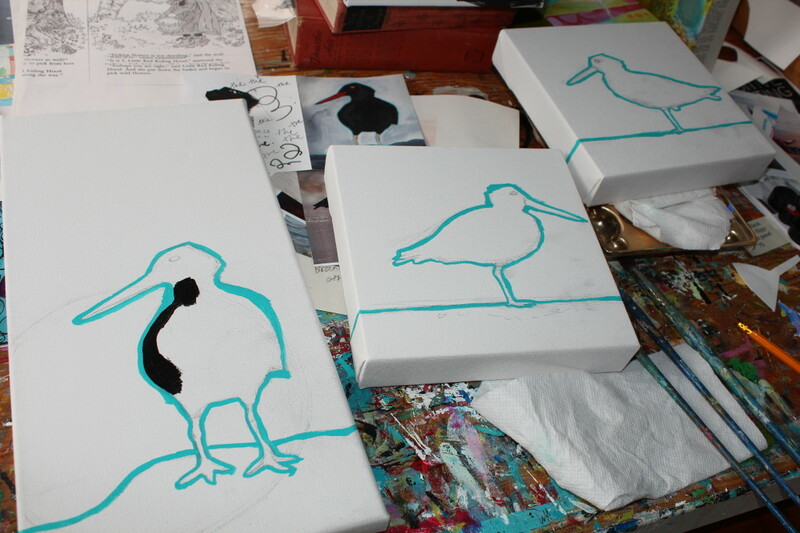 To my oystercatcher photos! 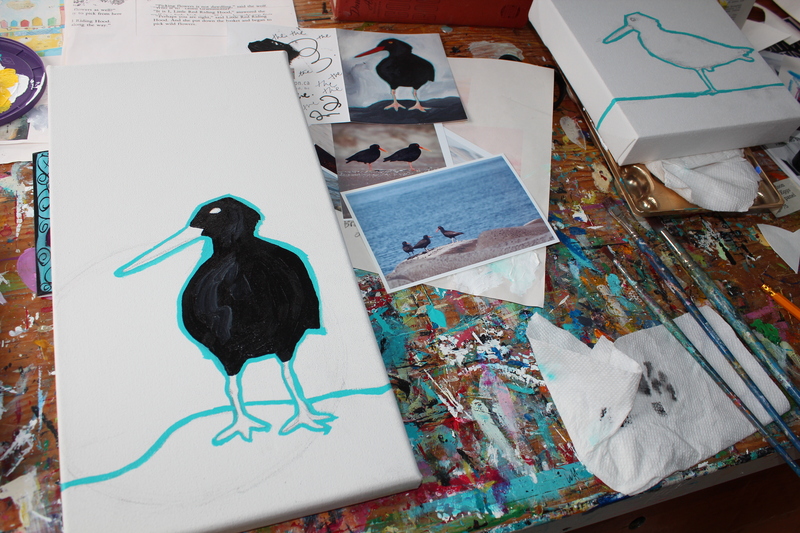 To a new batch of these cheerful black birds coming to life on my painting table! 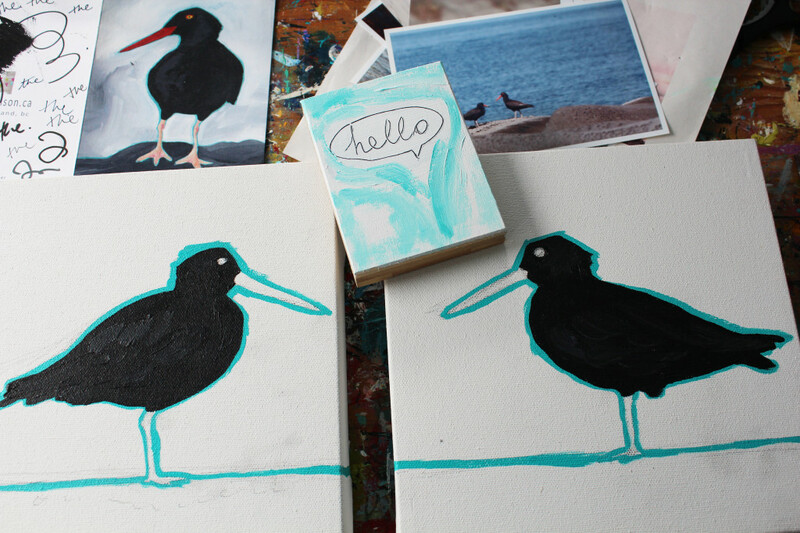 I have not finished them, but they really wanted to say “HELLO!” to you all….especially my blog friends that are participating in an Earth Day Art Challenge this weekend! 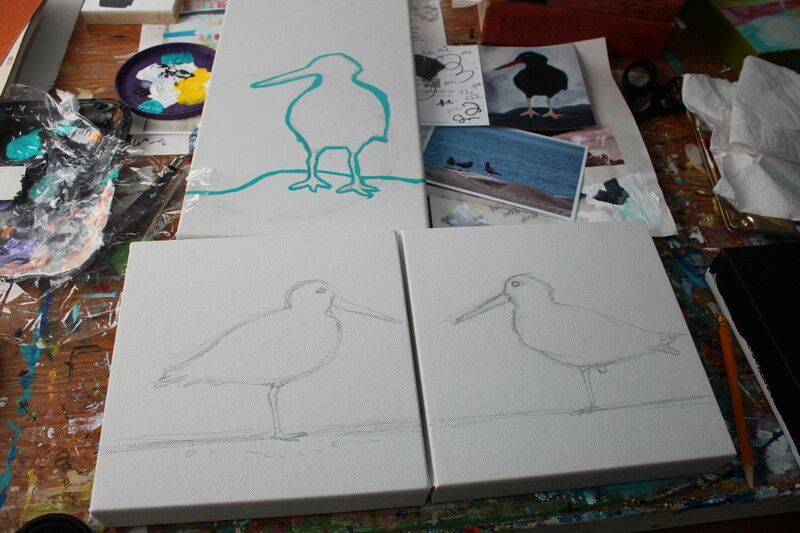 Here’s a few more pics to see how they came together….come back soon to see them all finished, with their bright orange beaks ready to chat some more! And here is where the magic happens, surrounded by trees and so much spring green! Hummingbirds and swallows zooming outside my window! Since this blog challenge was all about art inspired by nature, I have to share a little something my ten year old daughter made on Earth Day (for a friend’s birthday). Isn’t she sweet? After the wee fox (and my oystercatcher sketches) were complete, we went out and enjoyed a walk in the forest and found the perfect picnic spot next to a stream. The sounds of the water flowing and children giggling filled me up more that my yummy organic sandwich could and when the rain started to fall gently through the canopy my heart swelled with the perfection of the moment! Happy Earth Day everyone! I am so grateful for all that our home provides every day – nourishment and life and so much BEAUTY! I hope you have done something special to honour your connection to the Earth this weekend and I hope that you will check in to Melodye Shore‘s blog to see how others are expressing their gratitude to the Earth in her Earth Day Art Challenge. This entry was posted in Uncategorized and tagged art challenge, blog challenge, daughter, Earth Day, fox, Melodye Shore, nature, needle felting, oystercatcher, painting by admin. Bookmark the permalink. 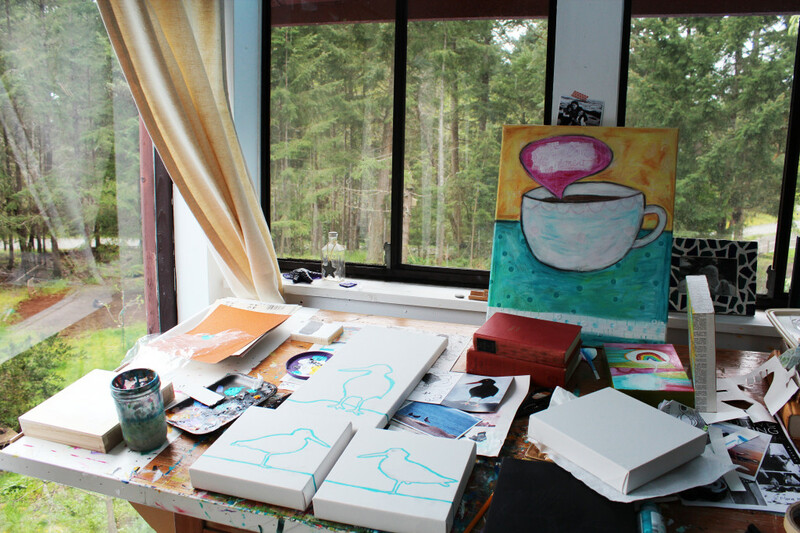 Oh Christy, it’s such a treat to peek inside your studio and to see your works-in-progress! 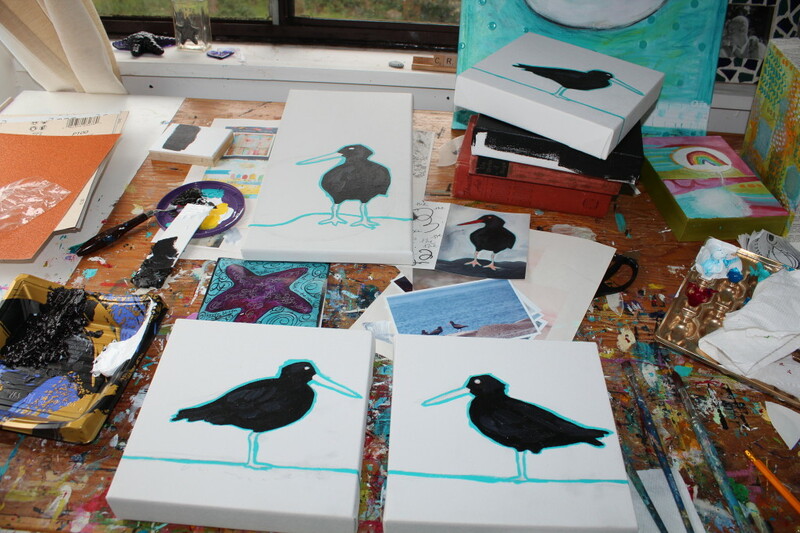 I became acquainted only recently with the Oyster Catcher, when I was serving as a docent at our local tide pools. Love that they have subdued, black feathers, and an outrageously orange beak. Crazy. Wonder how that color combination contributes to their survival–do you know? 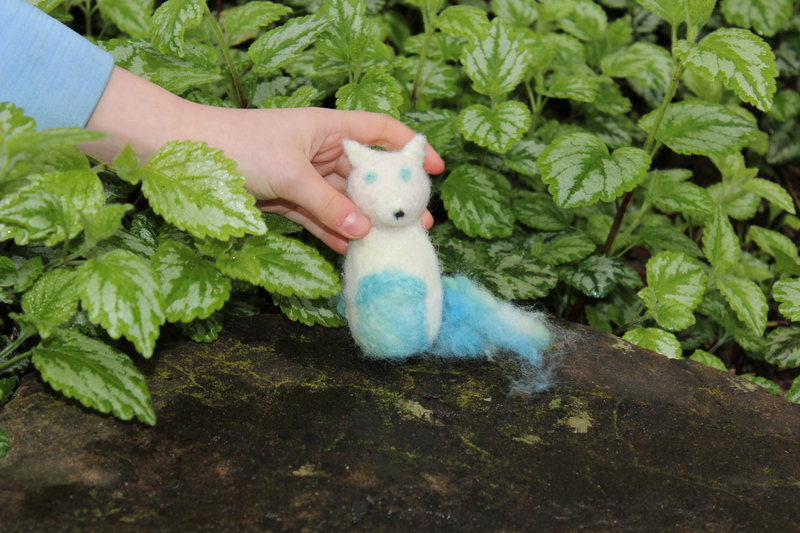 Thanks for joining our Art Challenge, and for adding your daughter’s beautiful, wee fox to our online gallery. See you again soon! Melodye, I love that you too help folks discover the magic of tidepools! My day job sees me as a marine and freshwater educator…..that being said, I too do not know how the wacky colours could have evolved over time! Must remember to ask my bird expert pals! Thanks again for including me (and my daughter) in this fab Art Challenge! Hello Lisa! Gosh we miss you! We take our juicy moments when we can get them these days (forest picnic happened right before dance lessons and birthday party!) ….come visit someday and we will picnic and craft together! hey Carole, wanna come play in my studio sometime! thanks for reminding me I have the best job!!!! thanks! i am super blessed tinyWOOLF! I just checked out your sweet blog and absolutely adore all the tiny books you are making! i also love the idea of the birds taking off from my canvas! so many nesting int eh trees that surround my studio these days and I can hear them chirping outside my window right now! It sounds as though you honored Earth day perfectly. I did something similar, but in a meadow and then wandered through a forest. You have a lovely spot for creating art. Your oster catchers are w joy to see. As is your charming fox. I looked out my window last night to see a fox, such a rare sighting for me. I watched it for 20 minutes. Happy Earth day!